My biweekly column on value wines, Wineau, appeared in the East Bay Express and the Monterey County Weekly from 2006 to 2010. 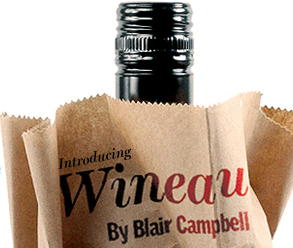 Wineau was named Best Newspaper Food Column in the Association of Food Journalists’ 2007 national awards competition. Based on the column, I was also awarded two fellowships (consecutive years) to the annual Symposium of Professional Wine Writers at Meadowood Napa Valley, as well as media scholarship to the Culinary Institute of America’s Rudd Center for Professional Wine Studies. A local winemaker uses his winery’s Web site to broadcast the following beliefs: that sarcasm is the purest form of communication, that Zinfandel should always be red, and that wine always tastes better in a chipped coffee mug. That last assertion would surely raise the hackles of a wine writer for a certain Bay Area daily, who insists that any drinking vessel with a rolled rim (and yes, alas, chipped coffee mugs qualify) diminishes the tasting experience because it prevents direct contact between wine and tongue. // Who’s right? Well, both — and neither. That’s the thing about belief — it implies subjectivity, so happily there is no right or wrong. We just think you’ve got to believe in something — and since we believe in great red wines that cost less than $10, we asked three East Bay wine merchants who earn raves from Wineaux and wine snobs alike to steer us toward their best low-priced offerings. The winners were a Cabernet from Chile, a Grenache blend from France, and a Tempranillo from Spain. Crowd-pleasers all, they inspired talk of faith among our assembled tasters, who included an Awestruck Agnostic, a Conscious Nonbeliever, and of course our Taoist Winemaker. . . .
Read the full column here. You can also check out an index of all 85 Wineau columns, or read my additional contributions to the Express including restaurant reviews and essays on food, wine, and books. My additional wine writing credits include Wine Enthusiast, Better Homes and Gardens, and Wired. Featured image courtesy Bayhaus on Flickr.